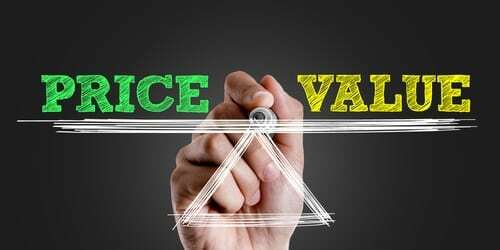 It’s been close to 20 years since Ron Baker published his book ‘The Professional’s Guide to Value Pricing.’ In that time, there’s been a lot of discussion about what value pricing really means and how it would change the face of public practice accounting. And what’s changed in that time? Surveys suggest that over 90% of accounting firms still use timesheets to record the time cost associated with ‘productive’ work. Value pricing has in some quarters taken on a definition that suggests that, if there’s an opportunity to extract additional fees from the client based on financial return to the client, then these fees should be taken. Beyond that, for many leaders and managers of accounting firms, value-based pricing has acquired a mysticism akin to the Holy Grail. This makes sense. Of course clients will assess the fee relative to their perception of value based on a range of objective and subjective factors. Market pricing and time cost are just two of the variables to consider when establishing an appropriate price for service. So, the current price sensitivity associated with compliance work is a clear example of value pricing. As this work becomes more efficient and takes less time, the price clients expect to pay for compliance work will continue to decrease. So, somewhere along the road to riches for accountants, a misconception has arisen as to the real intent of value pricing in servicing clients. By focusing on matters beyond time-cost, we’re more likely to establish a fee for service that takes into account all the factors involved in determining the client’s perception of value. The real challenge is that accountants often do underestimate the true value of their fees when work shifts from compliance to advice. Too often in the past, there has been a tendency to bundle all fees together, ensuring that the client actually sees less value in the specialist advice he or she receives than in the value of the compliance ‘output’ of the accounting firm. In a recent publication ‘Smarter Pricing, Smarter Profit,’ Stuart Dodds laid out a continuum of 16 different types of fee arrangements that professional firms should consider when engaging with their clients, with an hourly time-based fee at one end of the spectrum and value-based pricing at the other end. Other fee options discussed by Stuart included a retainer, a flat fee, a portfolio-based fee, a hold-back, a success fee and a contingency fee. Clearly, there’s a lot we have to learn about the pricing of professional services. The industry is just beginning this journey as it shifts towards more consulting and advisory work. So, using this as a starting point, what are the key challenges that accountants in public practice face in relation to value pricing and what can they do to address these challenges? 1.Clients believe that the advice provided in relation to financial matters is included within the compliance fee. Of course many clients will feel that everything is included, because that’s what they’ve been allowed to believe in the past. By bundling all services into the annual compliance fee, we’ve created a significant challenge when trying to charge for any advisory work, no matter what its value to the client. Already, progressive firms are addressing this issue proactively by unbundling compliance associated outputs with advisory associated conversations when establishing scope of work and fee for service. This way, clients immediately understand the relative values of different levels of service and they can make specific informed decisions as to the level of service they need and can afford. Of course, one side effect of this approach is that the true value of compliance is laid bare, resulting in further price sensitivity for this service. 2.Clients are unwilling to pay additional fees beyond the time-cost associated with the service provided to date. 3.Partners and Managers are unwilling to challenge themselves and their clients on the fees that they charge for advisory services. When there’s a perception of fee sensitivity, it can be quite difficult to summon the courage to suggest to a client that there will be an additional fee for an advisory service. Of course, what the client is actually complaining about is their perception of lack of value in the service currently provided. The best way to address this in any professional firm is to take the responsibility for the setting of fees away from the client manager or partner and to a group of people whose responsibility is the full engagement of clients including establishment and management of scope of work and fee for service. 4.It’s often quite difficult to establish in the client’s mind the true value of the service provided apart from the immediate financial impact. Of course, it’s easier to sell the value of a service based on an immediate financial impact rather than a future financial or emotional impact. However, both are just as important to the client. The challenge of accountants is make more time to talk with clients about their dreams and aspirations and to help them identify what’s holding them back. The identification of a value gap will make the job of establishing true value for service a lot easier and make the conversion process a lot simpler. The market will set the price, especially if there are a lot of competitors in the marketplace essentially providing the same undifferentiated service. Good service is no longer a differentiator, it’s an expectation. The more that you can move from a service based on commoditised outputs to that focused on clear areas of differentiation in services and delivery, the easier you’ll find it to charge for value of service. Value pricing is for real and it’s becoming more real as the industry shifts its focus from commoditised outputs towards stronger ongoing engagement with clients. If you’re struggling to identify what’s special about your firm in relation to your services, then it’s clearly going to be difficult to price on value. If you’re already creating the perception that your firm is different and you’re trying to engage more regularly with clients, then you’re no doubt already moving down the path towards value pricing. How effective is your firm at setting, getting and managing price? Are decisions made on a collaborative or ad hoc basis? Does your firm have a pricing policy? HTST has developed a self-paced 10 part eLearning course to help accounting and advisory firms develop and implement pricing policies relevant to the needs of their clients.The course is designed to be presented to the partners, managers and technical staff of accounting and advisory firms directly involved in setting and managing prices.